The idea of human-powered batteries has been with us for a while, and several piezoelectric devices are available (these use human motion to generate and store electricity). A radical new idea was unveiled by University of California researchers at the American Chemical Society meeting this week – temporary tattoos that generate electricity from sweat! This is achieved by an enzyme in the tattoo that strips electrons from lactate to generate an electrical current. The next step is to link this to a capacitor to store the electricity and then to mobile devices to power them! The less fit the individual, the more lactate they produce – and so lazy gym-goers should have more power to blast out motivational music during their workouts! 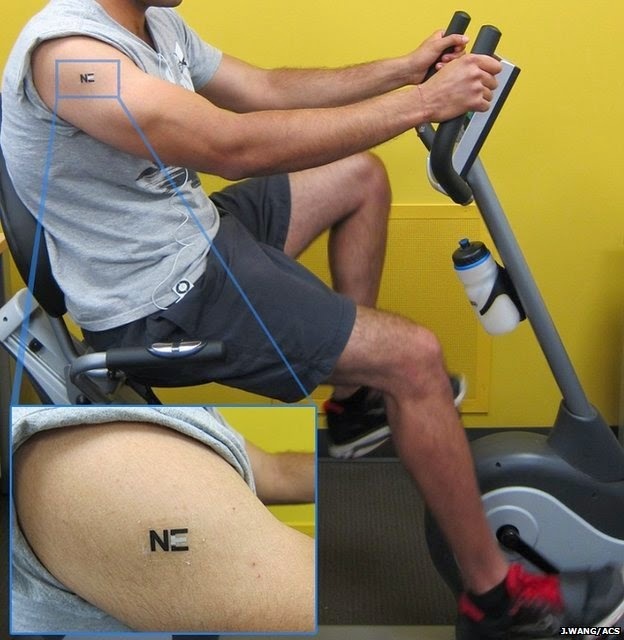 The bio-batterry is a lactate-fuelled tattoo that generates electricity (Image: J Wang/ACS).